Deep drawing Press is a manufacturing process that used press to form a sheet metal to molding, in which a sheet metal blank is radically drawn into a forming die by the mechanical action of a punch. Deep Drawing Press suits for manufacturing automobiles, motorcycles, and air conditioning and refrigeration units. Compare automatic production with older manual production, that deep drawing press will reduce more cost. Owing to the unit count increase makes unit cost decrease, especially beneficial the high-quantity production. In these situations deep drawing press may also prove the most cost-effective manufacturing solution. 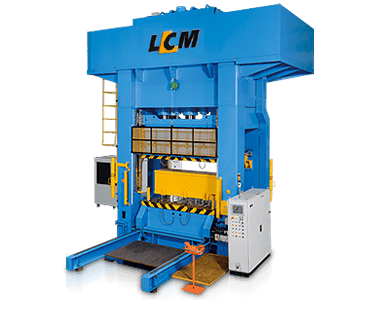 LCM is press and press maker who provides four different specified types of Deep Drawing Press, Drawing Press, Drawing Presses and Hydraulic Deep Drawing. Our machinery withstands weight between 800~1600 ton fully automated high speed hydraulic tandem line with sheet metal processing equipment, centralizing system and robot, it makes us more safely. Over thirty years, we have highly ability to provide quality precision, rigid, compact of deep drawing press. If you have any need about press machinery, please contact with us. We also offer Hot Forging Press, Forming Press, Metal Forming Press, High Speed Press, Mechanical Press. Just click left link you can get more detail about above the machinery information. Application: Sheet metal components for automobiles, motorcycles, air conditioning and refrigeration units, all types of domestic appliances and other requirements. 1. High speed slide approach and return functions. 2. Motors, valves and pumps are high efficiency and low maintenance with reduced power consumption. 3. Optical safety device, emergency stop button and two hand control station are standard equipment.